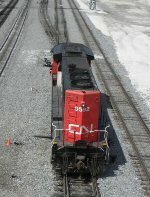 Description: Heading towards Mirro just months before they move to Mexico as CN 9592 struggles to make it up the short grade and slips on the icy rails. 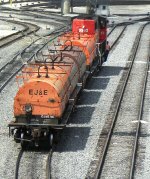 Description: Working the CN/EJE Joliet Yard on Mother's Day. Note the conductor heading down the steps to throw the switch. 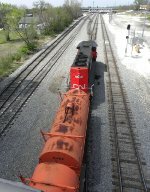 Description: Working the CN/EJE Joliet Yard on Mother's Day. Note the conductor riding the steps after throwing the switch. Description: Getting ready to pass under the US 6 overpass. 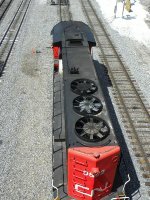 The conductor is still riding the steps on the upper left side. 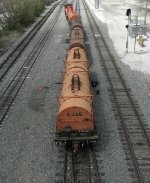 Description: Heading north into the Joliet yard with a small cut of cars. 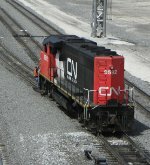 Description: Bringing up the rear of a small cut of cars being moved by CN 9592 at the CN/EJE Joliet Yard. 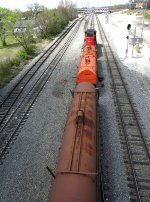 Description: CN 9592 leading the CN 331 train backs into the siding to pick up some LPG tank cars.